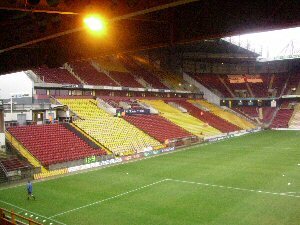 I'll be honest in saying that I was never overly keen on visiting Valley Parade because it looked like a right shithole on pictures on the internet, so you can imagine my delight when they were relegated to the same division as City. Upon a relatively quick journey lasting just over 70 minutes we arrived to find a lack of parking facilities, with only several cars being parked on the actual path giving us any indications of where to try. Not the best starts and that continued when they let away fans queue outside a set of turnstiles but not actually tell them that they wouldn't be opening them...gee....cheers. Once I got into the ground I was mildly surprised to be honest. Having thought it was going to be rubbish I found myself thinking it was quite decent, and the pitch was amazingly small for a stadium that size, meaning that the view of the action was excellent. 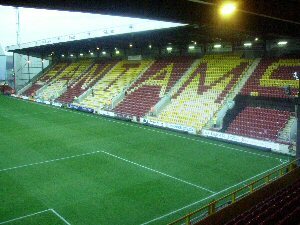 The away end was a two-tiered effort, similar to that at Brentford but both tiers were seated and you could see the line from the top tier. The view of the action was excellent with the small exception of the 2 poles in the way. The stand to our right was a bog standard single tiered stand, holding 5000 or so. The stand behind the goal and to the left were the same height at design, with both stands combined surely holding about 19,000. Unfortunately there was virtually not atmosphere from the home fans at the game, only singing in the few minutes after each of the goals they scored and this ruined it as an occasion. 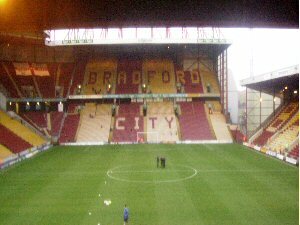 One thing I noticed about Valley Parade though, having heard stories about their fans I was pleasently surprised that they were quite friendly. I didn't hear one snide comment during the day and that came as a big surprise. 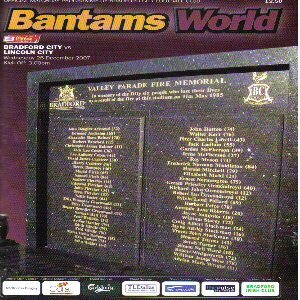 Overall I quite enjoyed my trip to Valley Parade and would highly consider coming here for a random game given that it took sod all time to get there and back. I would recommend this trip to most people and I hope I get a chance to go again.